Barack Obama’s Israel trip: Benjamin Netanyahu will learn that he can insult the president and fail to advance the peace process and still land a presidential visit from the White House. Netanyahu insults the president, backed Romney, and hasn’t moved the peace process. No White House should reward behavior like that, not even from an ally. 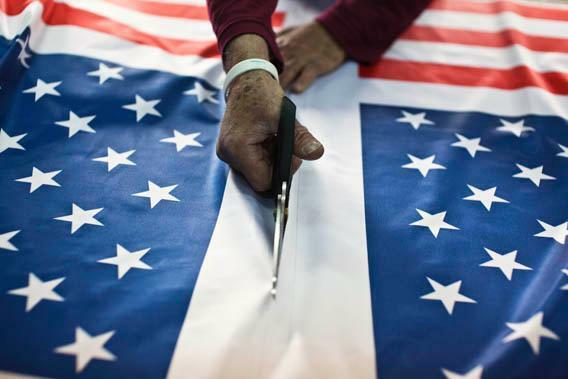 A worker at a factory near Tel Aviv cuts fabric printed with U.S. flags in preparation for President Obama’s visit to Israel. I get the logic of whoever dreamed up the president’s trip to Israel this week: Send Obama to reassure the Israelis he’s got their back on Iran. Demonstrate he doesn’t prefer the Arabs—an impression left in his first term when he visited Cairo but didn’t stop by Tel Aviv. Pay his respects at the graves of Israel’s fallen and acknowledge the historical artifacts that show Jews’ ties to the land. Let them know he really admires their technological prowess. Then maybe Israelis will feel more inclined to make peace with the Palestinians knowing the relationship with their most important ally is solid. But this trip—the timing and the script—makes no sense. And even more than simply being a big waste of Obama’s time at a moment when he has little time to waste, it’s burning crucial American political capital that ought to be reserved for moments that truly warrant it. The White House says the president is going to hear out what the newly appointed Israeli government has planned. Here’s a quick preview: Defense Minister Moshe Ya’alon wants to bomb Iran and Housing Minister Uri Ariel wants to build new settlements. If Obama wants to talk about drafting ultra-Orthodox Jews into the Israel Defense Forces or the price of apartments in Tel Aviv, he’ll find an audience. Those relatively marginal issues are what dominated Israel’s recent election, not the future with the Palestinians. Three years ago, Vice President Joe Biden went to Israel tasked with a similar mission—reassure Israelis that Obama loves them. Biden hit all the right notes, saying that the bond between Israel and the United States was “unshakeable” and “unbreakable” so many times that we reporters who covered that trip started keeping a running tally. Then as the vice-presidential motorcade was leaving the Yad Vashem Holocaust museum, news that Israel’s Interior Ministry had authorized 1,600 housing units in East Jerusalem destroyed what should have been a pure celebration of American-Israeli ties. Biden returned to his hotel to consult with the White House on what to say, leaving Netanyahu waiting awkwardly at his residence for an hour and a half for dinner. When Biden arrived, he issued an unprecedented rebuke that embarrassed the Israeli prime minister as they sat down to eat. American-Israeli ties remained sour. Two months after Biden’s visit, Obama refused to hold a photo op with Netanyahu when he visited the White House. The next year, when the president agreed to share the stage with Israel’s prime minister, Netanyahu lectured him before the cameras in the Oval Office on why Obama’s (hardly original) idea that the 1967 borders could be a baseline for peace negotiations with the Palestinians was bunk. In 2012, Netanyahu—frustrated that he couldn’t goad Obama into saying when the U.S. would bomb Iran—publicly suggested the president had no “moral right” to stop Israel from taking action itself. All the while, Netanyahu, over the past few years, did nothing to further peace with the Palestinians. He floated via surrogates that he thought Obama was naïve on the Middle East. And he left the strong impression last year that he was rooting for Mitt Romney to win the U.S. presidential election. The White House doesn’t want this trip to be about Netanyahu or his new government. That’s why Obama will address Israeli college students in a convention hall rather than speak to politicians in the Knesset. But when it comes to how this trip will be perceived in Israel, it will be all about Netanyahu and his political fortunes. Netanyahu will be seen as the victor in his battle with Obama, rewarded not only for defying—or standing strongly against, depending on one’s political perspective—an American president. And Netanyahu will learn one powerful lesson from Obama’s visit: I don’t have to do anything on the Palestinian issue. I can continue to expand settlements, focus solely on Iran, and insult the U.S. president, and he will still come and thank me with a two-day dog-and-pony show. It’s clear why the White House wants to avoid the thorny Israeli-Palestinian disputes of Jerusalem, settlements, and refugees. Past presidents have expended enormous time and energy on the matter and failed miserably. The last time Obama tried to articulate some guiding principles on borders, he got shouted down by Bibi. The United States “will always continue to be engaged in this process in terms of trying to move it forward,’’ Rhodes told reporters in a pretrip briefing that illustrated just how radically Obama has scaled back his ambitions since September 2010, when he said he thought peace could be achieved within a year. So why is Obama going? Is it really an attempt at “repairing relations with America’s primary Middle East ally” as the Washington Post’s Scott Wilson wrote? Or as Jeffrey Goldberg wrote in a column for Bloomberg, to reintroduce himself to Israelis and convey to them that he understands their situation? Perhaps. But if it is, then this is truly a waste of time. Just as Defense Secretary Chuck Hagel—whose nomination was held up by those who worried he wasn’t pro-Israel enough—wasn’t running for Israeli defense minister, Obama isn’t running for Israeli office (or any office for that matter). And anyone who knows Israelis and their current mindset on the Palestinians (Palestinians, who?) knows that a little ego stroking isn’t going to get that population behind a peace deal. That doesn’t mean the trip couldn’t do some good. While the president is there ostensibly repairing the relationship with Israelis who’ve felt jilted, Obama may be sending an important signal to Tehran. The message: Just because I can’t stand Bibi doesn’t mean I won’t stand with him in preventing you from getting a nuclear weapon. Since Obama is making the 12-hour flight, there’s one important thing he can accomplish if he wants to achieve something beyond simply making Israelis feel good. When he delivers his speech in Jerusalem on Thursday, he can remind Israelis that if they want their nation to be a nation like all others—one with internationally accepted borders, no longer targeted by divestment campaigns, and not facing a possible third Intifada—they need to stop saying they have no partner and make peace with Palestinian President Mahmoud Abbas before it is too late. And if they can do that, he looks forward to coming back a second time as president—when they have a peace deal to sign.